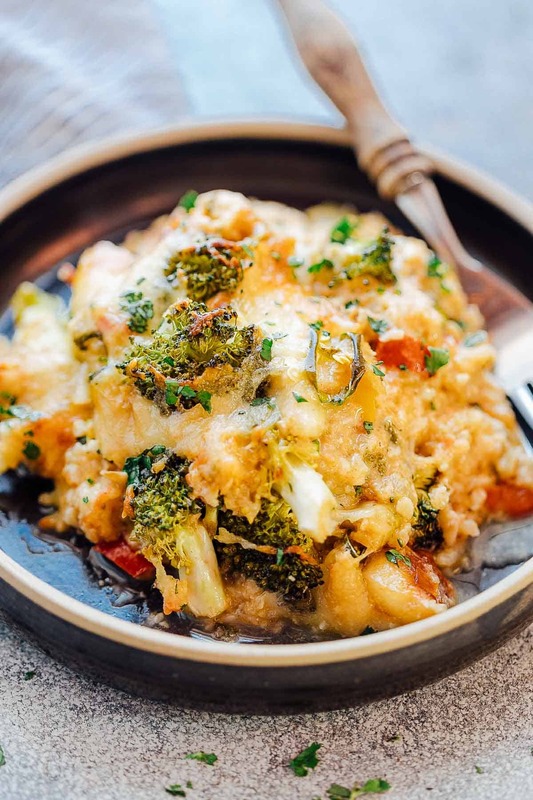 Healthy Cauliflower Rice Broccoli Casserole is a baked casserole dish thats gluten free, keto friendly and has loads of flavour. It’s super cheesy and perfect when you want a complete meal for dinner. This can double up as a side dish or a main dish. 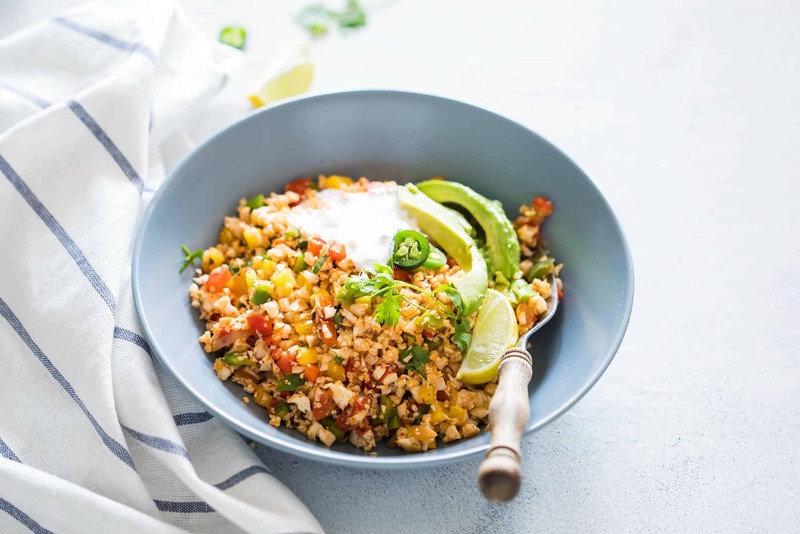 I’m digging cauliflower rice these days because its so healthy and clearly you guys love it too because this Mexican Cauliflower Rice is one of the most popular recipes on the blog right now. I recently shot a video for cauliflower rice and had so much cauliflower rice sitting in the fridge that we didn’t know what to do with it. So I decided to give it a makeover and combined two of my favourite things – cauliflower and broccoli to make this low carb, gluten free and super healthy cauliflower rice broccoli casserole. Full disclaimer: this is not one of those things that my husband likes to eat. But I love it. I’ve been having it for lunch two days in a row now. Sometimes I combine it with a piece of grilled chicken breast and other days with steamed veggies and its perfect. It doesn’t make me feel full or groggy but still gives my cheese craving soul a lot of satisfaction. That stringy cheese is real people! This casserole is not half assed or boring. 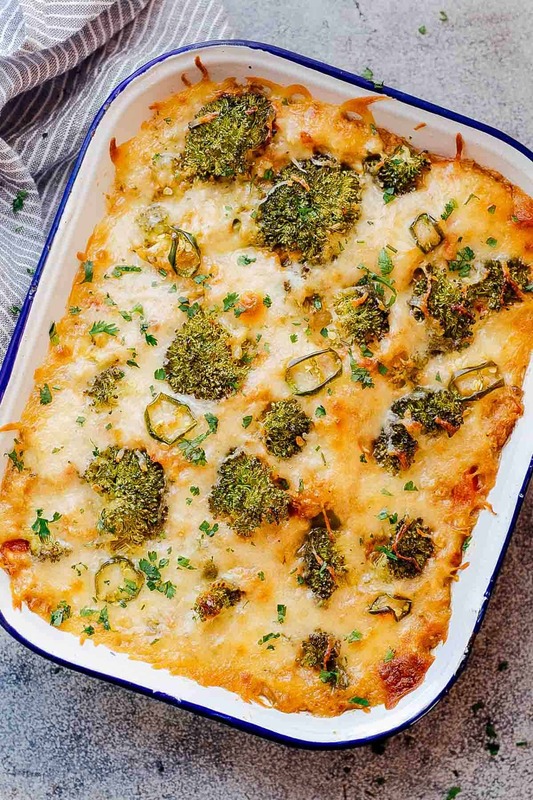 It’s got all the goodness of cauliflower, tons of broccoli, jalapenos, carrots and lots and lots of cheese. Because we like healthy to be tasty too. This is especially great if you are following a ketogenic diet and looking to switch things up a bit with your cauliflower rice. It’s really important that you don’t mash up your cauliflower completely, and keep it more ‘rice like’ so that when you actually make this casserole, the texture is that of rice and not just veggies. You can always prep this ahead and keep the casserole refrigerated. Then all you have to do is place it in the oven and bake for dinner. how to make cauliflower rice without a food processor? If you don’t have a food processor, don’t worry. You can just grate the cauliflower and it’ll turn into cauliflower rice as you grate it. So to make cauliflower rice, all you need is a good quality grater and you are good to go. In some parts of the world, cauliflower rice is also available in supermarkets but I haven’t seen that in India yet. I love adding lots of flavour to this healthy cauliflower rice broccoli casserole with garlic, oregano, thyme and paprika. If you still absolutely want your carbs, just slice up some crusty bread and you can satisfy all your cravings without the guilt! Rice the Cauliflower: Add all the cauliflower florets to a food processor and pulse a few times till the cauliflower resembles small bits like rice. Don’t go all the way or it can turn mushy. Cook the Cauliflower: Heat oil in a large pan and add garlic, jalapenos and carrots. Saute for a minute or two on high heat and add the riced cauliflower, oregano, paprika and salt. Stir fry the cauliflower for 3-4 minutes till the cauliflower becomes soft, but not mushy. Take a cup of this cauliflower mixture (reserve the rest) and blend with half and half (its okay if the sauce isn’t completely smooth). Add a splash of water or stock if you need to loosen things up in the blender, but don’t add more than a couple of teaspoons. 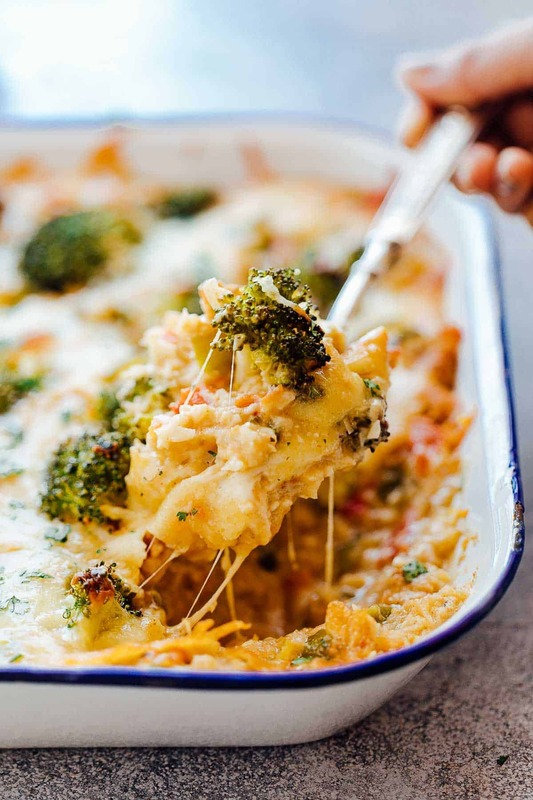 Assemble and Bake: Mix together the reserved cauliflower, cauliflower puree, broccoli and cheddar, and transfer to a baking pan or casserole dish. You can also use a cast iron pan if you like. Top with grated mozzarella and jalapeno slices, if using and bake for 45 minutes. Serve this healthy cauliflower broccoli rice immediately. Do you think that I could make this in a crockpot? It sounds delicious and want to free up room in my oven at Christmas. Thanks! I’ve never tried this in a crockpot so I’m sorry, can’t help you there. Very good. Took some work but might do it again. Delicious! I’m constantly looking for recipes that contain substitutes for potatoes, rice and pasta. We are trying to bring my husbands triglycerides down. Over the last year we’ve done well. So far, this is the best recipe! One of his favorite dishes is a broccoli-rice casserole his mother makes. I’ve never really liked it that much but I love this version! I love the addition of the jalapeños and carrots and the spices that hers didn’t have. I’m scouring all of your recipes now! I’m about to try your deviled eggs with bacon and hot sauce. (My hubby loves deviled eggs with heat) Vert excited about that recipe! So glad this topped the other casserole Kate. It’s one of those recipes which packs a lot of veggies but isn’t boring. I hope you try the deviled eggs too! This was so freaking good. Didn’t have jalapeno but it had tons of flavor. How much cauliflower rice do you use? I can buy cauliflower rice at the grocery store. Hey Jana – this would be approximately 4-5 cups. I’m sorry I’ve never measured it. Delicious. We are a family of meat eaters trying to find more main course veggie dishes to work into the rotation. This one is definitely in! Everyone including the 4 and 6 year olds thoroughly enjoyed this delightful dish! Hi Richa.l tried the mexican cauliflower rice recipe,lt was yummy.Everybody loved it. Keep sharing the vegan recipes for people like us as well. Love this recipe! it looks so delicious. keep posting such beautiful post. That must be 200 degrees Celsius.??? The heat of the oven was not enough to melt the cheese and it was just missing . . . something. Also, the heat of the oven did not cook the broccoli as well. Mmm! Love this healthy cauliflower rice broccoli casserole! Looks so delicious! Need to try the recipe asap!